Lisa is Bossy: Here turtle, turtle! Mmmm, brownies. Yummy, right? Add some chopped pecans... LOVE the crunchies. Brownies studded with chocolate chips... mmm melty. Caramel brownies?... oooh we're getting good. Let's imagine all of those components together... do I still have you? and it's a dessert - not just a brownie! This is another one of those really easy recipes to create with your own favorites. Just like the Boston Cream Pie! Easy, easy to make these unbelievably ooey, gooey, fabulous brownies. They're not even brownies anymore - they're this decadent dessert! 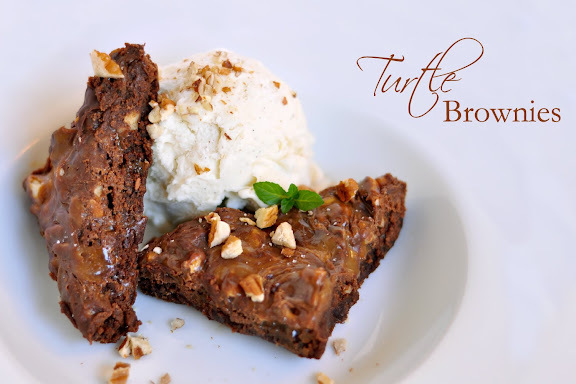 So just how do you make a Turtle Brownie? It starts with your favorite brownie recipe. We have one in my family that I use, but you could use your own. Or you could use your own favorite box mix - hey, I'm not gonna judge! These guys might be seasonal - I've never tried to find them during "non Fall"
Make your favorite 9x13 pan-size brownie recipe. As it bakes, unwrap 35 of those little square milk caramels you see so often in the Fall. I had a couple bags in my cupboard leftover from caramel apples. Otherwise, I'm not sure how easy they are to find other times of the year... Melt the caramels with 2 T of milk over a low to medium-low heat, until it's all melted and smooth. That was a couple of handfuls - by all means use more! As soon as your brownies come out of the oven, sprinkle them with a few handfuls of chocolate chips - however much you'd like! Then do the same with some handfuls of your favorite rough chopped nuts. I used pecans, but kept 1/4 of my brownies "nutless" for my allergic dinner companion. Pour it on; glop it on! Drizzle or pour the melted caramel over the top of the chips and nuts. Do it however you'd like: swirl, zig-zag, dump-out-and-spread etc. I decided to sprinkle a bit of kosher salt across the top since I find the milk caramels to be a little on the sweet side. The teensy bit of salt helped complicate the simple store-bought caramels. Let it sit for a bit to firm up (or not) and serve... with ice cream! There are so many things you could do with a good brownie... Rocky Road would be pretty easy to imagine up as well! 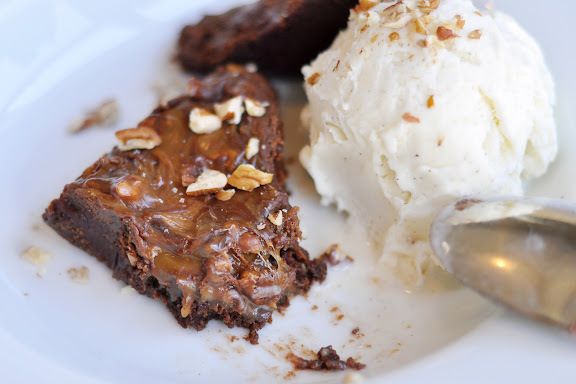 OMG- craving a brownie right now. I used to make Snickers brownies (always a hit) but these sound so much better. I think I just had a coronary, simply reading this post. Wow, those brownies look amazing!! i can't wait until i can eat chocolate without the heartburn afterglow (thanks to twinkle). as soon as i can, i want to try and make this! 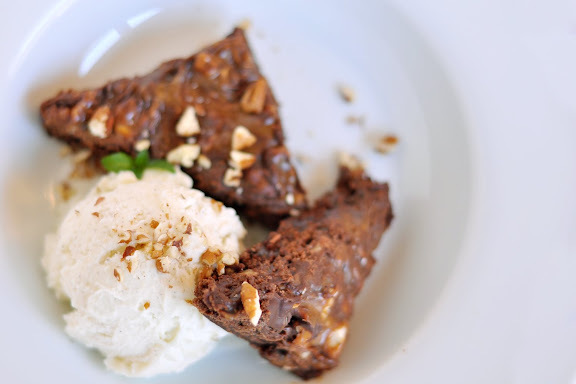 Oh my goodness, you are killing me with these recipes, I adore brownies and now, SO much more!